6. A Caring Society and Nurture Talent. Faced with the global political and economic uncertainties, the Financial Secretary’s 2019-20 budget is health-conscious with reduced ceiling of the salaries and profits tax rebates. Instead of counting on the traditional “four-pillar” service industries, the Financial Secretary intends to diversify Hong Kong’s economy by putting more resources on the eco-system of innovation and technology, high-end manufacturing industries, upstream activities of the four pillar service industries, and creative industries. CW also welcome the move of the Tax Policy Unit from the Financial Services and Treasury Bureau to directly under the Financial Secretary’s office, that would expedite the development of new tax measures under the new economy. 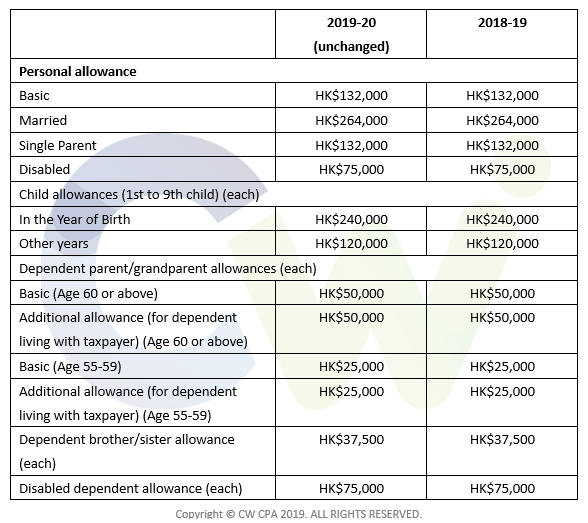 Salaries Tax, tax under personal assessment and Profits Tax for 2018-19 will be reduced by 75%, subject to a ceiling of HK$20,000 (2017-18: HK$30,000). The reduction will be reflected in the final tax payable for the year of assessment 2018-19. Expand the Economic and Trade Office network to strengthen external promotion and assist Hong Kong enterprises in exploring new business opportunities. 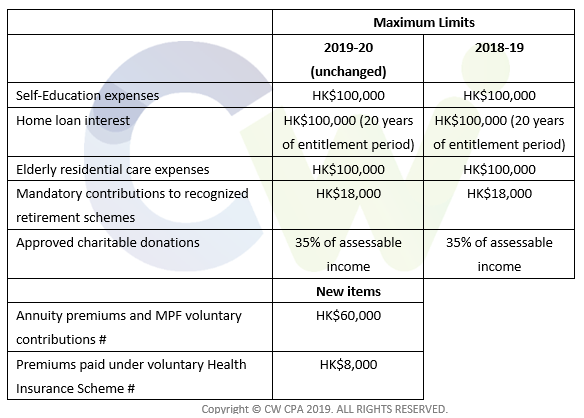 Provide a HK$400 million seed capital for the Financial Reporting Council and enable it to waive levy in the first two years under the new regulatory regime. Salaries tax is charged at the lower of net chargeable income (Total Income – Deductions – Allowances) at progressive rates or net total income (Assessable Income – Deductions) at standard rate. Standard rate remains the same at 15%. The standard rate (for non-corporate owners) remains at 15% for 2019-20.